All of us enjoy fighting in airplanes. Now, ben 10 fans can also enjoy it with Ben 10 Rebel Fighters. Bring down alien enemies aircraft by attacking them with missiles and bullets. With Kevin, Gwen, Bullfrag and Rook, destroy as many planes as you can to become the ultimate rebel fighter! 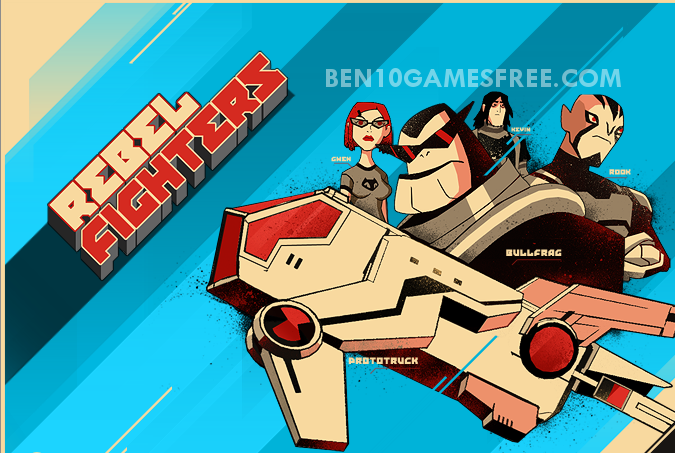 Ben 10 Rebel Fighters is a kind of star wars themed aircraft fighting game made especially for Ben 10 games lovers. The game features characters from the Ben 10 Omniverse series which was started in 2012 and ran for six seasons till 2014. In Ben 10 Rebel Fighters game, you have to fly a plumber Prototruck over the green plains with enemy crafts coming from all directions. Recommended: Play Ben 10 vs Alien Force game online now! Before you get flying, don’t forget to read some important stuff about the game below. Being a thrilling air adventure, Ben 10 Rebel Fighters is one of the favorite ben10 fighting game. The sole mission of the team is to destroy the enemy aircrafts with the powerful Prototruck. This game has multiple levels that are to be in continuation. When you one mission is completed, you keep on flying the Prototruck and the next mission target will be shown below. That means there is no time to wait for next mission to load. Each mission is to be completed in a given time; if the time runs out, you lose. Although the main aim is to bring down enemy aircrafts, there something else you must remember – collecting the plumber badges. The minimum number of badges to be collected is shown for each mission. Pro Tip: Avoid getting hit by the missiles from the enemy fighter planes, else you will lose power. There are two indicators in the game. One is the Prototruck health meter on the top left corner that indicates how much power you are left with. The second one shows the number destroyed crafts and the minimum crafts to be destroyed to complete the mission. So, now that you know all about ben 10 rebel fighters game, its time go flying! With Kevin, Gwen, Bullfrag and Rook, destroy as many planes as you can to become the ultimate rebel fighter! Don’t Forget to give your rating for Ben 10 Rebel Fighters game and share your tips and tricks to win this game in the comments section below.